The Timber Hill Winery family would like to encourage all to spend the holidays doing things you enjoy, with loved ones and friends and make your holiday season the best it can be. One way we know many of our customers will be doing this is by enjoying our wines. 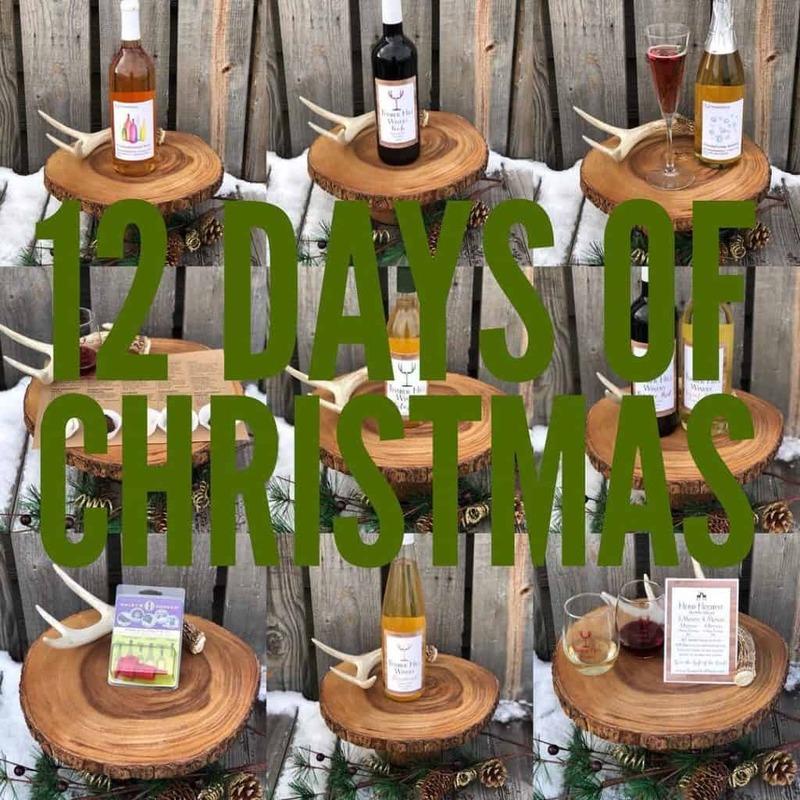 So today, we are excited to launch the first day of our 12 Days of Christmas and Great Holiday Wine Giveaway on Facebook. Each day thru December 21st we will be sharing tips on how to cook with wine, pair wine, shop for wine, enjoy wine and also give away something special to one friend who likes and comments on our posts. Prizes include Timber Hill Winery wine and accessories, including a one year wine club membership. On the 2nd Day of Christmas, mocha and vanilla made friends with my beef tenderloin! Most winemakers always get the question of what wines go best with a holiday feast. Our Foch is a dry red wine that is a deep ruby red. Our winemaker says it would pair great with your Christmas roast or beef tenderloin because of its robust flavors that hint of mocha and vanilla and give a smooth and enjoyable finish to heavier meals. On the 3rd day of Christmas, my wine made me blush! really be uncorked any day of the week. Hop on your sleigh and grab a bottle of #TuesdayBoozeday. outing since just about anyone can taste wine, all they need is a glass and our easy steps to wine tasting. 1. Look: Check out the color, opacity, and viscosity, also known as the wine’s legs. smells. Don’t be frustrated by smelling more than one aroma we would rather you relax and take a sip. there any characteristics that shined through and impressed you? Now go buy a bottle to enjoy at home! On the 5th day of Christmas, I wrapped my presents and drank a Brandy Old Fashioned! The winery recently helped ring in the holiday season, by completing our popular #SocialSweetSeries as the long awaited seventh and final day of the week, #FinallyFriday was added to the mix. This is a sweet red wine with an extra flare of Wisconsin Brandy. For a limited time, you can stop at the winery and our winemaker Amanda will cheerfully mix you up a Wisconsin favorite, the Brandy Old Fashioned using her #FinallyFriday wine. Or, grab a bottle and enjoy this specialty wine while wrapping your Christmas gifts at home. On the 6th day of Christmas, I fooled the elves and used wine as my secret ingredient! Jalapeno Wine?! Yes, it is true, Timber Hill has a wine made from jalapenos! And just like a fresh jalapeno, it is bold and spicy! Only the brave can sip it by itself, but once you add it to some of your favorite winter recipes like fajitas, chili, or even your Bloody Mary, you will see how delicious it can be. We guarantee you will add one more thing to Santa’s list. On the 7th day of Christmas, my kids were sassy and my wine was too! On the 8th day of Christmas, I planned my holiday meal! The general food pairing methodology that aids in holiday meal plans says that dark meats like beef typically go well with heavier, robust red wines and wines that pair with chicken or ham dishes are usually lighter in flavor and color. We like to tell people to keep it simple, have a both a red and white wine available, but most importantly always drink the wines you enjoy the most. On the 9th day of Christmas, my wine didn’t give me a headache! The holidays often push us to overfill our plate and our glass, especially if we are enjoying ourselves at a holiday party or get together. We suggest you stick to the rule of moderation, especially when it comes to alcohol. You will thank us for this advice later. It only takes three standard glasses of wine for men and two for women to start feelings those rosy cheeks come alive. Put a cork on your wine and enjoy what is left at another time. If you do over indulge and your cup has runneth over, under no circumstances should you drive. On the 10th day of Christmas, my wine made my house smell magical! There is nothing like the aroma of mulled wine filling your house around the holidays. Our mulling spices are made with nutmeg, cinnamon, and orange peel. It is very easy to mull wine and it’s a nice way to warm up on a cold winter day. We recommend using an electric kettle, crockpot, or sauce pan on your stove top- just use the lowest setting! We typically warm with wine with the mulling spices for 30 minutes to an hour. This allows for all the spices to soak into the wine. We usually use about one tablespoon of spices for one bottle of wine. Our favorite wine to mull is our famous #ThrowbackThursday Red, a sweet red wine made with Concord grapes. If you prefer a drier option, Foch or Frontenac make for a lovely dry mulled wine. This giveaway is open only to Wisconsin residents who are 21 years of age or older at time of entry. Runs 12/10/18 to 12/21/18 with a total of 12 days of prizes. To enter, participants must like and comment on day of entry post. This promotion is in no way sponsored, endorsed or administered by, or associated with Facebook. You understand that you are providing your information to the owner of this Facebook page and not to Facebook. Please enjoy our wines responsibly.